Abstract. The Coupled Model Intercomparison Project (CMIP) has successfully provided the climate community with a rich collection of simulation output from Earth system models (ESMs) that can be used to understand past climate changes and make projections and uncertainty estimates of the future. Confidence in ESMs can be gained because the models are based on physical principles and reproduce many important aspects of observed climate. More research is required to identify the processes that are most responsible for systematic biases and the magnitude and uncertainty of future projections so that more relevant performance tests can be developed. At the same time, there are many aspects of ESM evaluation that are well established and considered an essential part of systematic evaluation but have been implemented ad hoc with little community coordination. Given the diversity and complexity of ESM analysis, we argue that the CMIP community has reached a critical juncture at which many baseline aspects of model evaluation need to be performed much more efficiently and consistently. Here, we provide a perspective and viewpoint on how a more systematic, open, and rapid performance assessment of the large and diverse number of models that will participate in current and future phases of CMIP can be achieved, and announce our intention to implement such a system for CMIP6. Accomplishing this could also free up valuable resources as many scientists are frequently "re-inventing the wheel" by re-writing analysis routines for well-established analysis methods. A more systematic approach for the community would be to develop and apply evaluation tools that are based on the latest scientific knowledge and observational reference, are well suited for routine use, and provide a wide range of diagnostics and performance metrics that comprehensively characterize model behaviour as soon as the output is published to the Earth System Grid Federation (ESGF). 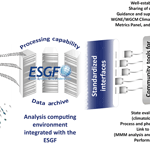 The CMIP infrastructure enforces data standards and conventions for model output and documentation accessible via the ESGF, additionally publishing observations (obs4MIPs) and reanalyses (ana4MIPs) for model intercomparison projects using the same data structure and organization as the ESM output. 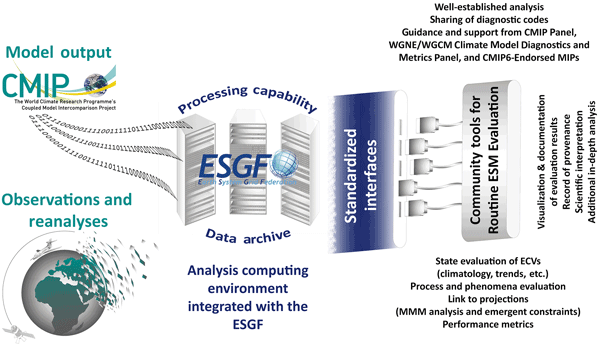 This largely facilitates routine evaluation of the ESMs, but to be able to process the data automatically alongside the ESGF, the infrastructure needs to be extended with processing capabilities at the ESGF data nodes where the evaluation tools can be executed on a routine basis. Efforts are already underway to develop community-based evaluation tools, and we encourage experts to provide additional diagnostic codes that would enhance this capability for CMIP. At the same time, we encourage the community to contribute observations and reanalyses for model evaluation to the obs4MIPs and ana4MIPs archives. The intention is to produce through the ESGF a widely accepted quasi-operational evaluation framework for CMIP6 that would routinely execute a series of standardized evaluation tasks. Over time, as this capability matures, we expect to produce an increasingly systematic characterization of models which, compared with early phases of CMIP, will more quickly and openly identify the strengths and weaknesses of the simulations. This will also reveal whether long-standing model errors remain evident in newer models and will assist modelling groups in improving their models. This framework will be designed to readily incorporate updates, including new observations and additional diagnostics and metrics as they become available from the research community. How to cite: Eyring, V., Gleckler, P. J., Heinze, C., Stouffer, R. J., Taylor, K. E., Balaji, V., Guilyardi, E., Joussaume, S., Kindermann, S., Lawrence, B. N., Meehl, G. A., Righi, M., and Williams, D. N.: Towards improved and more routine Earth system model evaluation in CMIP, Earth Syst. Dynam., 7, 813-830, https://doi.org/10.5194/esd-7-813-2016, 2016.